Maura Donavan stare at the woman in shock. Did she hear correctly? The woman said, “I’m your Mother.” She hadn’t seen her Mother since she was 2 years old. Maura feelings were mixed. They were sitting in the Gardai station as her Helen Jenkins, her Mother is waiting to be interviewed about the unexplained death of her Mother’s employer. Maura was having problems getting her emotions under control. Maura works with the Gardai to find answers to the death. Will Maura be able to clear her Mother’s name? Is there romance in Maura’s future? I highly recommend this book and series. Disclosure: I received a free copy from Crooked Lane Books through NetGalley for an honest review. I would like to thank them for this opportunity to read and review the book. The opinions expressed are my own. 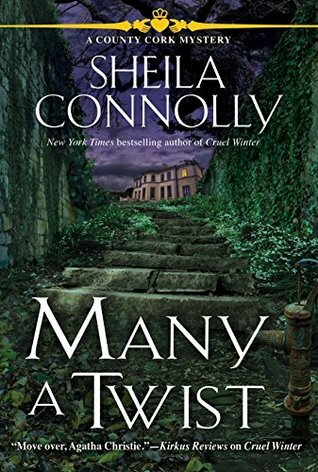 This entry was posted in #NetGalley, Books, Uncategorized and tagged cozy mystery, Favorite, Maura, Mother, Shelia Connolly. Bookmark the permalink. I have yet to read a Shirley Connolly story, I didn’t like. This is one of the best series. I was surprised that it is already archived. I am not Shelia Connolly is a very popular author. I considered her a good read every time.